If you’re over 20 and are having trouble getting through the week (y’know, because Trump, Flynn, air pollution and the like), remember that you can always have a go with The Magic iPod to bring back the good ol’ days. 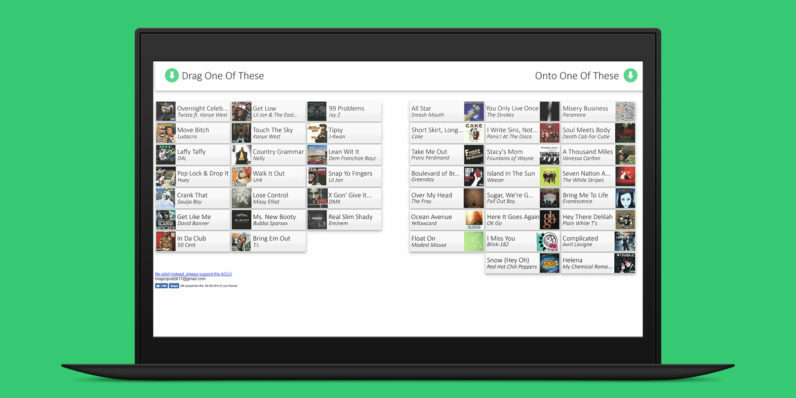 This clever site from way back in 2007 lets you mash up some of the biggest hip-hop, pop and rock songs from the early 2000s to create a masterpiece that you’ll want to blast from the rooftops all day long. It’s dead simple too: Just grab a hip-hop track from the bunch on the left and drop it on a song from the list on the right. The ones that work with your initial selection are highlighted so you don’t need to worry about matching tempos and keys. You can even download your creations with a single click. I’ve spent the better part of this morning combining tracks instead of combing through tech news, so approach this with caution if you intend to get any work done today. Think you can top that? Let us know about your best mixes in the comments.